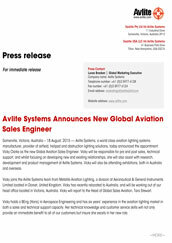 Somerville, Victoria, Australia – 18 August, 2015 — Avlite Systems, a world class aviation lighting systems manufacturer, provider of airfield, helipad and obstruction lighting solutions, today announced the appointment Vicky Clarke as the new Global Aviation Sales Engineer. Vicky will be responsible for pre and post sales, technical support, and whilst focusing on developing new and existing relationships, she will also assist with research, development and product management at Avlite Systems. Vicky will also be attending exhibitions, both in Australia and overseas. Vicky joins the Avlite Systems team from Metalite Aviation Lighting, a division of Aeronautical & General Instruments Limited located in Dorset, United Kingdom. Vicky has recently relocated to Australia, and will be working out of our head office located in Victoria, Australia. Vicky will report to the Head of Global Sales Aviation, Tara Stewart. Vicky holds a BEng (Hons) in Aerospace Engineering and has six years’ experience in the aviation lighting market in both a sales and technical support capacity. Her technical knowledge and customer service skills will not only provide an immediate benefit to all of our customers but insure she excels in her new role. Vicky can be contacted directly on: +61 (0)3 5971 6434 or alternatively, you can contact her on email: v.clarke@avlite.com. Please don’t hesitate to reach out and welcome her aboard. Connect with her on Linkedin.